Data Sufficiency (DS) questions use the same math concepts as Problem Solving questions, but ask a unique type of question that many students initially find confusing. DS questions ask you a question, usually but not always accompanied by some initial information, followed by two statements labeled (1) and (2) which contain additional information. Your objective is to determine whether statements (1) and/or (2) separately or combined provide enough (i.e. sufficient) information to derive one definitive answer to the initial question. Other than the information explicitly stated, you cannot assume anything besides indisputable facts (e.g. there are 60 minutes in an hour). DS questions always present the same five answer choices. In order to save time, it is best to memorize these answer choices rather than read them each time you face a DS question. A helpful acronym by which to memorize the answers is 12TEN. (A)	Statement (1) ALONE is sufficient, but statement (2) alone is not sufficient. (B)	Statement (2) ALONE is sufficient, but statement (1) alone is not sufficient. (C)	BOTH statements TOGETHER are sufficient, but NEITHER statement ALONE is sufficient. (D)	EACH statement ALONE is sufficient. (E)	Statements (1) and (2) TOGETHER are not sufficient. When evaluating sufficiency, the key is to determine whether it is possible to derive one definitive answer to the question asked. There are two broad types of DS questions: numerical value and Yes/No. For numerical value questions (e.g. What is the value of x? ), you must be able to derive one exact number (e.g. x = 37) to have sufficient information. If you could come up with multiple numbers or a range of values, you do not have sufficient information. As the name implies, Yes/No questions (e.g. Does x = 37?) can be answered only with a yes and/or a no (e.g. yes, x does equal 37). For these questions, you must be able to answer definitely yes or definitely no to have sufficient information. There are two broad approaches to DS questions. The often-faster, more theoretical approach entails offering a mathematical justification. For example, one general algebraic principle is that if you have an equal number of unique linear equations as you have unknowns, then you can solve for the unknowns. In this case, you do not actually have to solve out the equations; merely knowing that you could solve them and derive a unique answer is all that matters. A second approach entails plugging in numbers. You try different numbers that meet any given constraints to check whether those different numbers could yield different answers or always yield the same answer to the question asked. In order to help make this more concrete, let’s try a sample problem. Attempt the problem on your own before viewing the answer and explanation. If a, b, and c are positive integers, is (a + c)(b + c) an odd integer? See above for answer choices. Since this question involves addition and multiplication of odd and even integers, it’ll be helpful to first review the relevant rules. In case we don’t remember one of these rules, we can easily verify by trying simple numbers. For example, since 2 + 1 = 3, we know that even + odd = odd. The question asked is a Yes/No question. If the answer is always yes or always no, then we have sufficient information. If we could come up with a yes or a no answer, we do not have sufficient information. Let’s start by evaluating (1). Case 1: Let’s say that b and c are both odd. Then we have (odd + odd) x (odd + odd) = (even) x (even) = even. Case 2: Since our first case yielded an even integer, we now want to check whether it’s possible to get an odd integer. This only happens if we have odd x odd. So how can we get odd times odd? What if b is odd and c is even. Then we have (odd + even) x (odd + even) = (odd) x (odd) = odd. Since we have a NO case and a YES case, (1) is not sufficient. Using our answer elimination flowchart, we know that answers A and D are eliminated, whereas answers B, C, and E are still possibilities. Let’s now evaluate (2). Case 1: Let’s say that a and c are both even. Then we have (even + even) x (even + even) = (even) x (even) = even. So how can we get odd times odd? What if a is even and c is odd. Then we have (even + odd) x (even + odd) = (odd) x (odd) = odd. Once again, we have a NO case and a YES case, so (2) is not sufficient. Using our answer elimination flowchart, we can now also eliminate answer B; answers C and E are still possibilities. 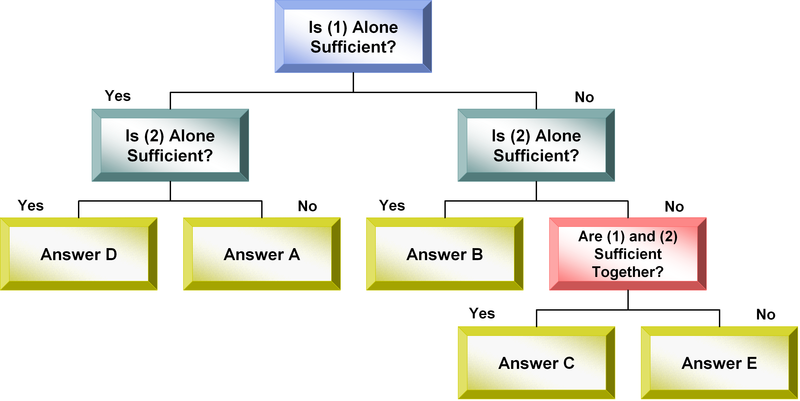 Because neither (1) nor (2) is sufficient alone, we must evaluate (1) and (2) used together. Case 1: Let’s say that c is odd. Then we have (odd + odd) x (even + odd) = (even) x (odd) = even. Case 2: Let’s now say that c is even. Then we have (odd + even) x (even + even) = (odd) x (even) = even. In both possible cases, we can answer the original question with a NO. Since we have a definite answer to the original question (NO), statements (1) and (2) together are sufficient and we pick answer C.
Note that the above explanation takes the mathematical justification approach by using the odd/even rules. For this problem, we could have just as easily tried plugging in numbers. Let’s see how this would work in evaluating (1) and (2) together. Case 1: Let’s say that c = 3 (odd case). Then we have (1 + 3) x (2 + 3) = (4) x (5) = 20 = even. Case 2: Let’s now say that c = 4 (even case). Then we have (1 + 4) x (2 + 4) = (5) x (6) = 30 = even. As before, we can answer the original question with a NO in both cases, so we pick answer C.